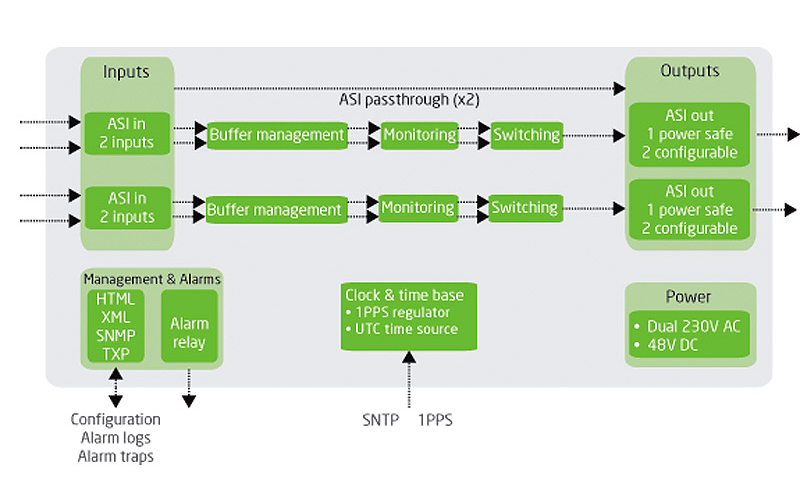 The TNS541 enables intelligent 1+1 redundancy switch-over between two MPEG-2 transport streams. With dual power supply and seamless switching the TNS541 improves the reliability and robustness of your system. Our seamless switch solution continuously monitors both incoming MPEG-2 transport streams for status and switches over automatically if required, based upon customer configurable criteria. The TNS541 safeguards the delivery of high-quality video content, by providing 24/7 monitoring, advanced analysis and redundancy switching. TNS541 is control system independent and operates as a stand-alone monitoring switch with an easy-to-use WEB interface for access and control. The product monitors both incoming MPEG-2 transport streams for health status and switch-over is be based on configurable switching criteria. All systems requiring intelligent 1+1 switch-over between two MPEG-2 transport streams.